This is a list of the average priced 2012 funeral compiled by the National Funeral Directors Association. This does not include the cost of a burial plot, cremation fees, headstone or flowers. 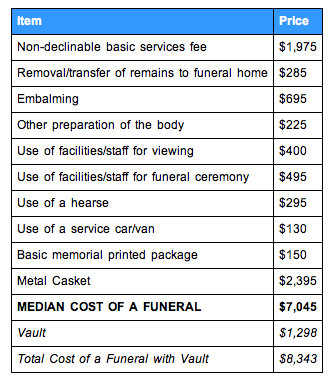 The average cost of a funeral in 1960 was $708. In 1980 it was $1809 and in 2000 it was $5180. Many families are unable to raise the funds needed for an average priced service. 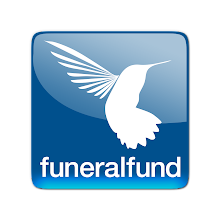 This is why Funeralfund.com was created. Crowdfunding for funeral expenses is a way the entire family and community can share the expense. Online donations can be accepted anywhere the internet is available, bringing family members who are far away within reach. Yes it is becoming difficult to manage funeral cost these days. Many families find it very difficult to get funds raised. Although prices for everything has increased but if you choose wisely and select quality services which don't compromise the quality but offer at attractive rates then we can surely save some money i.e. for funeral program templates you can have look at funeralparlour.com they provide great personalized templates at competitive rates. And they also offer many other funeral program services at cheap rates with great quality.